Ahead of the Academy Awards, we’re reviewing each short category. See the Live Action section below and the other shorts sections here. It’s a rather shrewd personification that’s at the back of Alison Snowden and David Fine’s Animal Behaviour. We accept the impulses of animals — even adore them sometimes — but prove desperate to curb our own. The idea is that they don’t know better and we do. It’s our more evolved brains that allow us to see how harmful our impulses can be and decide to consciously work towards correcting them. Those who can’t and, more importantly, those who refuse are thus deemed “animals” themselves. Murderers, rapists, and other violent criminals are relinquished of their humanity because they acted without thinking. So the joke is therefore to fantasize what it would be like if wild beasts felt our shame and regret. How would their therapy sessions unfold? The punch line is of course that they wouldn’t be much different than our own. So you let the animal with the most capacity for training to be the psychologist (Ryan Beil’s dog Dr. Clement) and play up the stereotypical traits of others as his patients. There’s the separation anxiety-ridden leech (Leah Juel’s Lorraine), the perpetually single mother of thousands praying mantis (Andrea Libman’s Cheryl), the gluttonous self-sabotaging pig (Toby Berner’s Todd), the obsessive-compulsive cat (Snowden’s Linda), and the guilty bird with long-term memory issues (James Kirk’s Jeffrey). They form a tight-knit bunch that has become aware of each other’s hang-ups and works to keep them at the forefront of their present to learn from rather than act on. And then Victor the ape (Taz Van Rassel) arrives. How does the latter’s anger affect his inclusion and ultimately alter the group’s dynamic? Does injecting such a raw lack of impulse control into a session wherein everyone more or less talks about accepting their issues and coping with them rather than struggling for a solution prove a gross miscalculation? He brings a lot of stimuli to combat — enough that even Dr. Clement risks regressing to his past canine proclivities. The result is a funny satirical look at our own psychological fragility through the guise of cartoonish buffoonery with a few authentic moments that might just stop you in your tracks. Victor is desperate after all, but will only accept his temper exists once it inflicts pain onto others. I’m sure many audience members can relate. Watching the first half of Domee Shi’s Bao with a quizzical expression is par for the course. How could you not react that way with this story of a Chinese-Canadian woman who begins to treat a hand-made dumpling like it is her child? It’s one thing to gasp and laugh when the tiny piece of food begins to wail as she attempts to take a bite, but another to witness as it sprout arms and legs before moving through the motions of adolescence. By the time “he” turns into a rebellious teenager with a goatee who refuses to listen to or acknowledge the formerly tight-knit relationship had with his mother, it’s hard to know where Shi might go. And then comes the moment everyone will talk about afterwards. I don’t want to spoil things — although I’ve seen many on social media spilling the beans because of the deed’s provocative nature — so I’ll just say the mother does what any parent might if his/her food was making impulsive decisions that may or may not take it down a path of no return. It’s human nature to want to protect your child so fervently that you overreact in the moment and risk ensuring a difficult situation turns nuclear. There comes a time when every kid starts to yearn for an escape out from under the shadow of his/her guardian in order to experience true freedom of choice. This moment can feel like a battle between two forces that cannot see clearly, each doubling-down to the point of fracture. This film is therefore a metaphor for the heavy emotional toll an empty nest provides. We’re watching as a mother seeks to reclaim a past she’s yet to outgrow. But no matter how hard she tries to recreate the magic of early parenthood, a child’s wishes to fly the coop arise regardless. That desire for more is an intrinsic characteristic ushering us towards adulthood and something we all must accept no matter the pain or irrational sense of abandonment it carries. All we can do as parents is supply a measured response to maintain a loving connection devoid of the pettiness and anger age’s inevitable erasure of superiority brings. You can’t shield your baby from suffering, but you can make certain that you aren’t the one causing it. Shi delivers a heartfelt look at a rough psychological experience rarely seen in coming-of-age films considering they’re almost always focused on the child. But just as our youth endures the unpredictability of adolescence’s growing pains, adults are also unprepared for their roles as stewards within that process. Children mature until they’re ready to relinquish the safety net that so long protected them from the dangers their false notions of immortality allowed. And at the same time parents see the role of protector that they so readily accepted fade away — or at the very least become a secondary concern about advice rather than law. Where the former move towards promise, the latter can languish within a void defined by absence. Our hope is that distance doesn’t mean they’ll forget. Good luck keeping a dry eye during Louise Bagnall’s heartfelt look at an elderly woman suffering from an Alzheimer’s-like disease. Even when the endgame is obvious, you can’t stop the emotions from rising within. I’d argue that knowing what’s coming before it does only makes the result more potent because you can anticipate the act but not the method. And with swirls of color, morphing shapes, and characters spanning time before making way for others, the journey becomes an unpredictable ride through the recesses of a fractured mind pulled towards clarity by the most innocuous triggers imaginable. It starts with a biscuit dropped in tea and continues with books, motions, sounds, and mirrored images folding in on themselves to shine a light on Emily’s (Fionnula Flanagan) fading truth. To say more would ruin the carefully measured rhythms within Late Afternoon that Bagnall creates. Just know that it’s a swift progression from Emily’s distant past to the present with an unwitting catalyst in the form of her nurse Kate’s (Niamh Moyles) constant movements around the house and objects shared. The way the surface of tea shifts to become an orb of light or reflections on the wall into train windows will have you fully engaged in this roller coaster ride of disjointed vignettes that become the puzzle pieces of our lives. And even though we know the ending won’t last, its sharp cut to black ensures we understand that this Emily right now will live forever regardless of whether anyone is lucky enough to see her again. We don’t do anything alone in this world, but sometimes we do have a tendency to forget it until those who’ve helped us have disappeared. 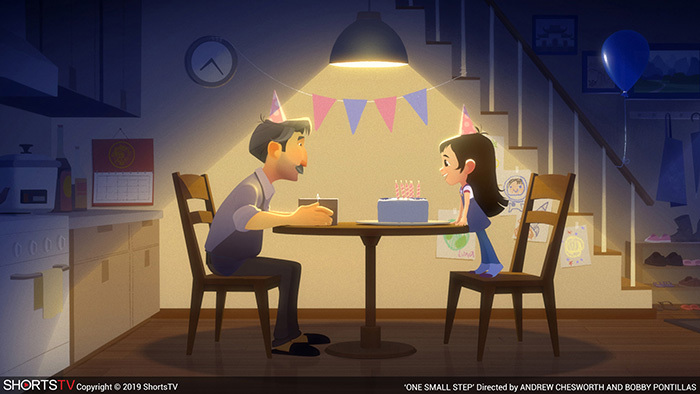 This is the message behind Andrew Chesworth and Bobby Pontillas’ One Small Step, the sweetly told journey of a young Chinese American girl dreaming of space from a cardboard box shuttle with her Dad in the backseat. The filmmakers move us forward through the years with that flight of fantasy becoming an adolescent mission. From ear-to-ear smile in moon boots jumping on the bed to the pensive dedication of a teen hitting the books to no avail, we see how nothing is worth doing if it isn’t still fun. Sometimes as adults we must rediscover why we pursued our paths in the first place. 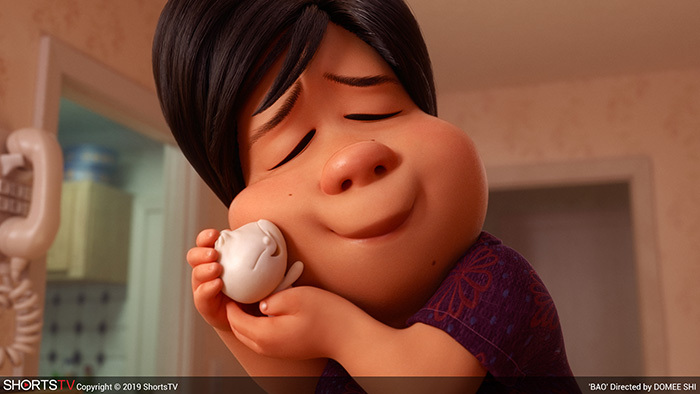 Think of it as a mix of fellow animated short nominee Bao and the vastly underrated feature First Man with time separating father and daughter until the space between can no longer be bridged by anything other than the memory of love and its propulsive ability to pull Luna further than her isolation ever could. As she detached herself from family life, her father kept to his routine. He gave her the space to grow and discover what was necessary for her to succeed, but never gave up on the hope of one day finding her in her seat like the past months and years apart were but a dream. And while the final result might be bittersweet, it’s no less heartwarming or resonant. He was there when she wasn’t and he’ll remain despite being gone. Why wouldn’t a child of divorce remember his youth as a horror film? You have the responsible parent languishing in the midst of an in-progress home as she struggles to remake her life and the unpredictable “cool” parent who gets to shirk his duties and simply provide fun for two days in a bachelor pad decked out with everything no middle-aged man needs. And then come Mom and Dad’s “friends” — the formidable father figure replacement looking to horn in on your monopoly of maternal warmth and the out-of-nowhere mother figure seeking to destroy the rule-free sojourns into tech-heavy playtime. The abode that feels empty becomes a prison with a monster coming and going freely while the shelter that feels like a vacation teeters on the edge of oblivion. Writer/director Trevor Jimenez renders this surreal nightmare in 1980s Toronto with a crudely beautiful hand, the scrawled lines providing character and spontaneity once the young boy at its center can no longer stop his mind from conjuring the worst. His instincts are sound, though. He sees Mom’s new boyfriend’s inherent sense of oppressive ownership and Dad’s new girlfriend’s sudden appearance as a harbinger of the end. Jimenez shows Mom’s maturity in trying to be civil and Dad’s brattiness in rebuking each attempt. We wonder why they separated only briefly before clichés arise to ensure the reasons are made inconsequential. One yearned for adulthood while the other clung to youth. One was strong and yet positioned to be let down, the other destined to remain weak and forever untrustworthy. Weekends thus sends us into the formative mind of a child in conflict watching as his world is shattered and than pieced back together without his input. He sees life with Mom as a challenge with opportunities for rough days and time with Dad as a reprieve to do whatever he wants devoid of consequences. So it’s only when each brings a third wheel to the equation that we can begin to understand where their allegiances lie and which of those lives was the start of something real and which the end of a flimsy façade that couldn’t last. This is tough subject matter for a child and Jimenez isn’t about to sanitize it with bright colors or happy endings that are anything short of melancholy at best. Eventually this boy’s footing will stabilize, but the floor may not be the one he hoped to find or expected to prove victorious. Dreams of a perfect family fade and the horrors of uncertainty get replaced by the tragedy of reality. We become drawn to the gradual evolution and devolution of the rooms that define these adults, watching as cracks are filled and widened depending on which home we’re in. Heroes who’ve refused to repeat destructive patterns inevitably vanquish monsters and children find their guardian whether it is son with mother or husband with wife. In the end everyone is trying to find happiness. Some take shortcuts and others put in the work. And the boy in the middle must wait to see which is which. 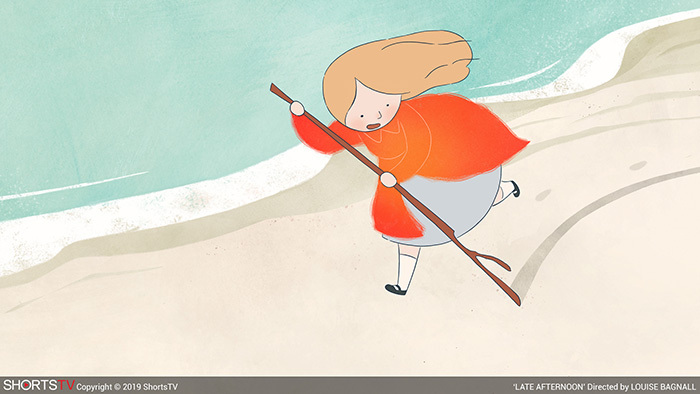 The Oscar Nominated Shorts are in limited theatrical release starting February 8th. 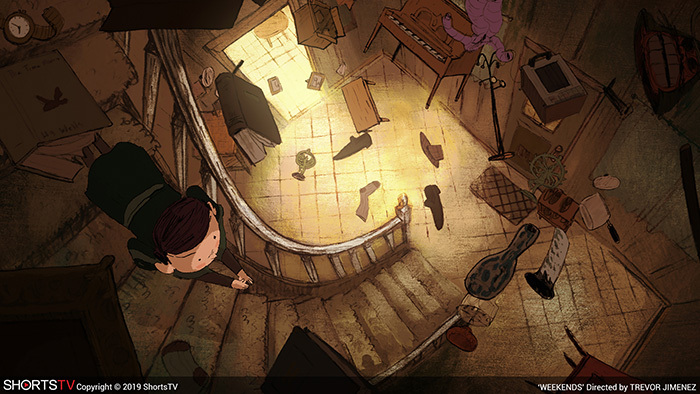 See the official site for more details and our reviews of the other shorts sections here.